Roo-yah. Ri-ya. Ray-a. Ryan. I've pretty much heard my name butchered in every single way. Ever since I've gone to school (which is like, my whole life) I've heard almost everyone pronounce my name wrong. 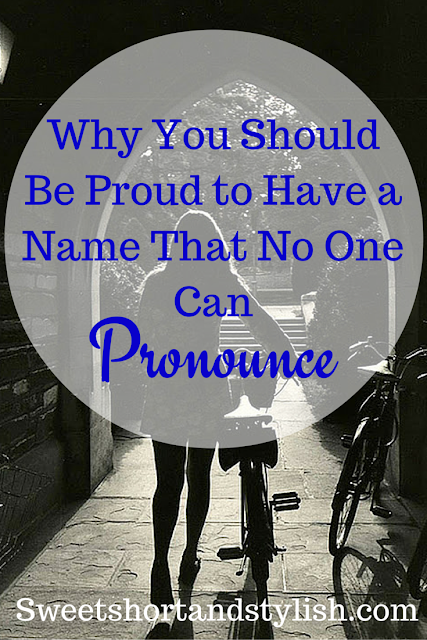 Some people react politely and say "That's a beautiful name!" (shout out to those people, you make me have faith in humanity again) while others not so kindly. Many times it seems to be my professors who are saying things like "Wow your parents screwed you up for life" or the classic "Did your parents spell your name wrong?". Sounds like a great way to start the first day of school am I right? I just love attendance. Yes, I have a unique name. Yes, it may take you "a while" to remember it. Yes, I need to correct you if you say it wrong (I've actually heard people say I'm "bitchy" because I correct them ha!). It's my name. You see, I always believed that there is one thing that we are born with and die with and that's our name. It follows you all throughout life and even if you do change it, there's still a part of you that remembers your original name. There is so much power behind it. Think of how long it must've taken your parents to choose a name for you. They didn't just come up with it out of the blue, there was thought put into it. I come from a Turkish family and my parents wanted to give me a Turkish name despite knowing that I would be born and raised in America. They wanted me to always have a direct connection to my culture. By not remembering my name or pronouncing it incorrectly, it's almost like an insult! It's almost as if people are saying "I don't care how your name is pronounced because you're not important". It's embarrassing, depressing, and a constant battle that I have to go through my entire life. I know I'm not the only one who goes through this and it may not seem like an important topic, but we need to start appreciating people's names more. It's their identity, personality, past, present, and future all wrapped up into one. A few weeks ago, I realized that this situation had finally gotten to me when I realized that I had introduced myself to someone and right after telling them my name...I apologized for it. I did it without even realizing it. Later on did I realize how sad it is to apologize for your own name. It's as if my name is an inconvenience for people. Don't be the person that apologizes. Don't be the person that's nervous every time attendance starts. Most of all, don't be the person that's ashamed of their name. Proudly tell people your name, loud and clear so it gets through that you're important, just like everyone else. Besides, a unique name is more memorable. Why would you want to be like everyone else anyways?